Outside the church, the day care children helped prepare last year’s palm leaves for use on Ash Wednesday. Some remembered waving the branches last year. As they worked, the pastor talked with them about the rituals; later that day, she visited their classrooms and showed them the ashes. In Perkins, Okla., a longtime mission to provide affordable day care with a Christian curriculum is re-energized. 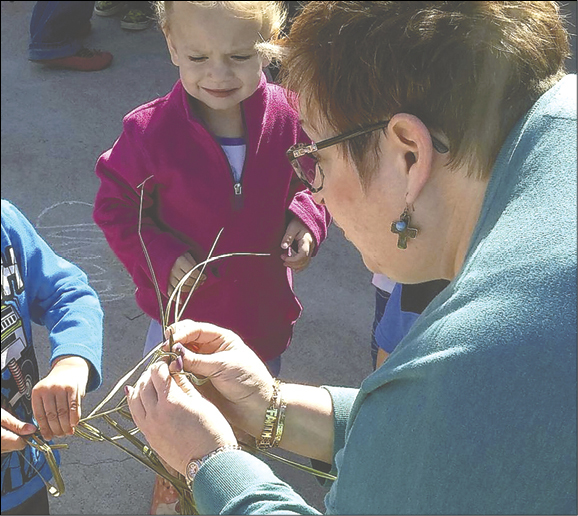 Because two United Methodist churches, Perkins-First and Lost Creek, partnered for the kids, the Educare program is "in a positive season," according to director Marcia Hargrove. This program showcases United Methodist connectionalism. Enrollment is 65 children, Hargrove reported, with 30 of those attending after school. Educare operates at Perkins-First, which is just across the street from an elementary school. Day care hours are 7 a.m.-6 p.m.
South of Stillwater, rural Lost Creek UMC is about 5 miles from Perkins, population 2,831. Weekly worship at Perkins-First averages 48 people; Lost Creek, 199. Pastors Laura Glover of Perkins-First and Max Rudd of Lost Creek began discussing shared day care ministry in 2015. They credit Mike Wiley of the Oklahoma United Methodist Foundation with introducing the idea. By early 2016, the collaboration was under way. "It was a need for the community that wasn’t being met," said Rev. Glover. "Day care is expensive, period. There are a lot of families in the community that struggle financially. We try to make sure to the greatest extent possible that it is affordable." From both churches, eight to 10 people meet monthly as the Educare board; a Christian curriculum committee meets quarterly; and churches’ members serve alongside parents on workdays. The licensed day care, for children ages 12 and younger, has seven full-time and six part-time staff members. At Perkins-First, "almost all the space is used during the week" for the day care, said Tish Malloy, Northern Prairie District superintendent. She said First UMC members are "all in" to help children as their primary ministry. For Lost Creek UMC, Educare is one of numerous ministries that have evolved since that church purchased property in Perkins. "They are two distinct congregations," said Rev. Malloy, but also "very close to one another. They’ve handled it beautifully. Those two pastors did the work to bring them together." Rev. Rudd said, "It isn’t a normal thing to share." But key Lost Creek leaders returned from an initial meeting about the vision and said, "We need to do this," he recalled. "Our people are really passionate, excited about it," he said. "I honestly have seen the hand of God on all of it," Glover said. "There is no ours-mine-yours, no sense of discord. I think it has been an opportunity to see how well we really can work together." Director Hargrove said some Sunday School classes have pooled funds to help children in special circumstances. A church women’s group donated new toys; volunteers painted classrooms. "Members of both churches donate generously with their time and money," she said. The Oklahoma United Methodist Foundation and the Central Rural Electric Cooperative gave seed money as well. Each week, Hargrove said, the staff incorporates Bible lessons planned by the curriculum committee. A recent focus was on friends, drawing on the story of the paralyzed man whose friends helped him meet Jesus. "My staff love and respect the children in their care," Hargrove said. She taught public school for 27 years. "Several staff are here at God’s calling. I do believe that God has brought us all together in this place for a reason." 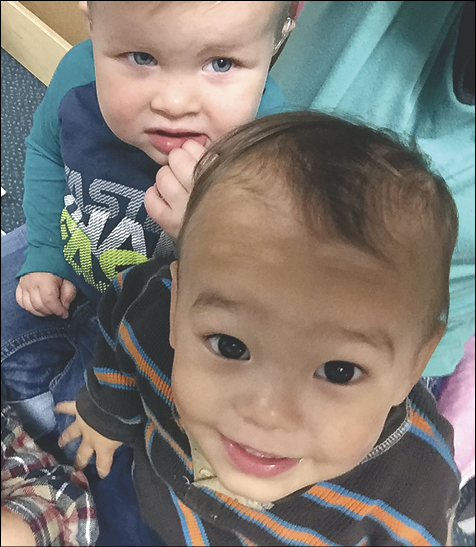 Welcome, little ones—Two churches in the Northern Prairie District made affordable Christian day care a shared priority in a more rural setting. Jesus is smiling. Laura Glover shows children enrolled in Educare how to fold dried palm branches at Perkins-First UMC.